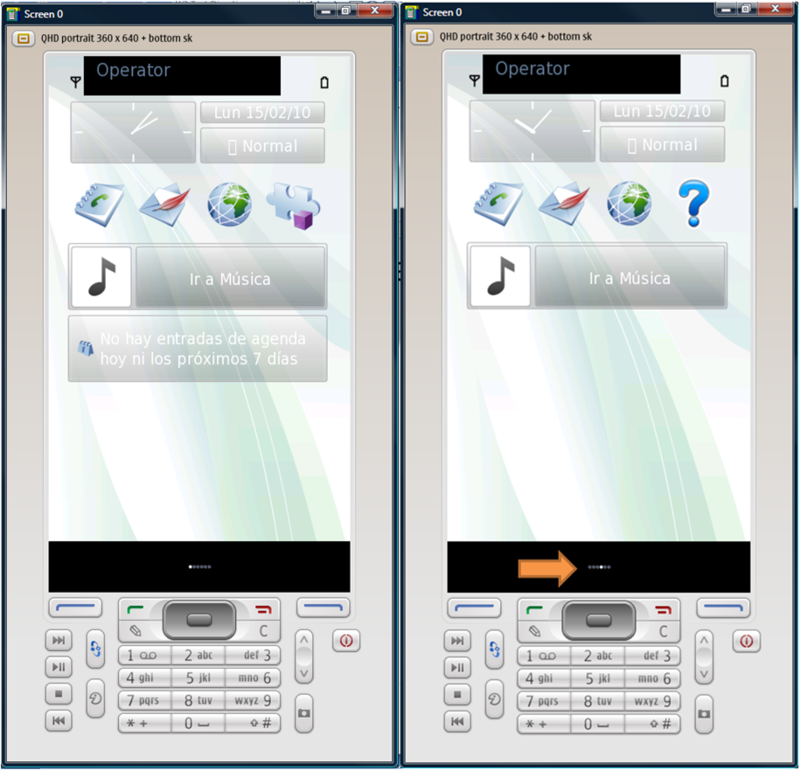 I wanted to share with you a couple of new features that have been added into the Symbian^3 release and that have a very visual impact in the emulator. These screenshots have been taken from PDK_3.0.f. First of all is the Localisation support. Maintaining a UI in multiple languages is not an easy or cheap task. Nokia has contributed their localisation support, and it is a simple to set up as changing a digit in a text file (thanks to Mattd for the tip!). I have changed my PDK to my native language: Spanish. The second functionality is the support for multiple home-screens, which we have heard so much about. At boot-up the emulator has 7 screens, all with the same setup. You know in which screen you are by looking at the small collection of dots at the bottom of the screen (I have added an orange arrow to the screenshot above to make it easier to spot them!). Use the left soft-key to get into the edit menu. This will bring up a version of the home screen where you can add and delete the displayed widgets. The empty boxes containing a “+” are currently empty and you can add stuff by selecting them. 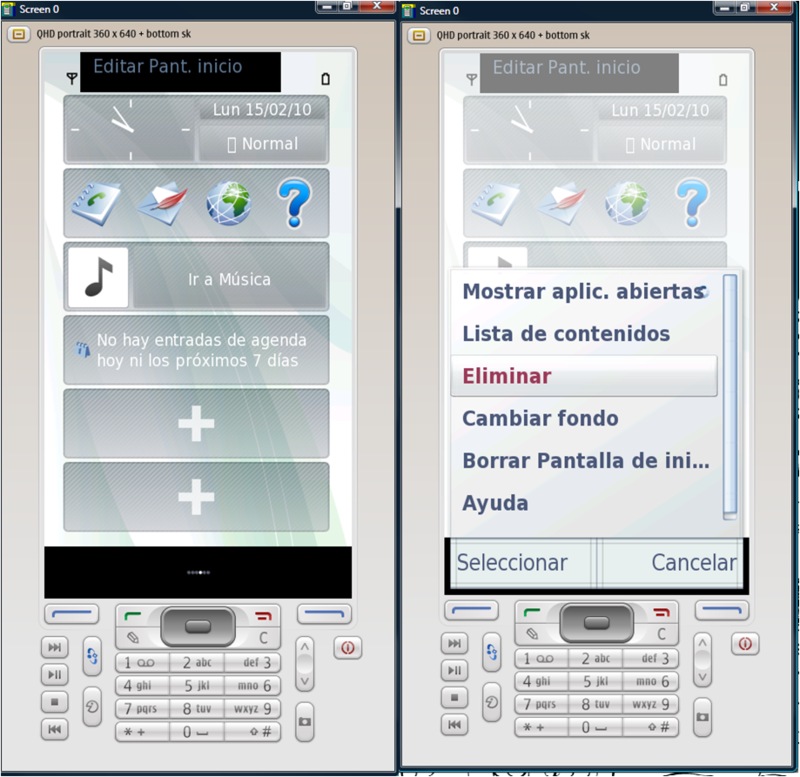 If you select an box with a widget , a menu appears that allows you do stuff such as changing the background of the screen or deleting (“Eliminar”) the selected item. And that is how you do it with PDK3.0.f and later releases! Nokia has recently released a video that shows how these Symbian^3 UI features are meant to work with a touch-screen enabled device, much more glamorous! Next Post Symbian PDK in Catalan! I should try to find out what is the number for catalan!